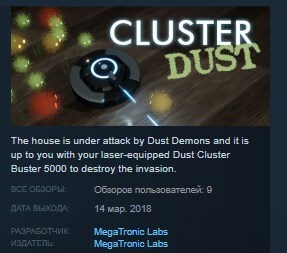 The house is under attack by Dust Demons and it is up to you with your laser-equipped Dust Cluster Buster 5000 to destroy the invasion. Sail around the room shooting ever-spawning Dust Demons but watch out because the longer you last, the faster they come! Periodic shipments of heavy laser shots will help you blast groups at a time and furniture can be knocked around by your shots to make blockades and divert the approaching cluster! Every time you are hit, you lose charge so top off at one of the three charging pads in the room. The objective is to play until you die. Try again to beat your high-score! This game will be updated multiple times with improvements and bug fixes. This is the first of what will be many games by MegaTronic Labs so I hope to get lots of feedback so I can improve not only the game, but myself in the process. Thank you for your support!